Remote controlled airplanes make a great toy for kids of all ages, and adults will love to join in the fun, too! There is a range of styles available, so we have made your job easier by choosing our favorite picks. Each plane has been reviewed and the key features outlined so you can find one to best suit your child’s age and ability. There are a few important things to think about before buying a remote control airplane for your child. If you choose a plane which is too advanced, your child will struggle to keep it flying and may become frustrated. However, you shouldn’t choose something which is too basic or has poor features, as they will quickly get bored with it. So, it’s important to carefully consider your child’s skill level before buying them their first RC plane. Think about your budget too. If your child really wants to get into the hobby of flying RC airplanes, you may benefit from choosing a top-of-the-range model with advanced features. If you are simply choosing them a new toy, a cheaper model with less impressive features is usually sufficient. Consider where the plane toy will be getting used. If it is going to be flown in the house, it’s better to choose one which isn’t too fast or difficult to maneuver. Similarly, if you wish to fly outdoors, make sure the plane has a large enough range that you won’t keep losing signal. With any remote controlled toy, you should think about how many people will play at once. Some toys only have one frequency, meaning the only one can play at a time. If there are two or three frequencies, it means it’s possible to race. This option is great if you are buying two planes for siblings, or if you want to use them with friends. 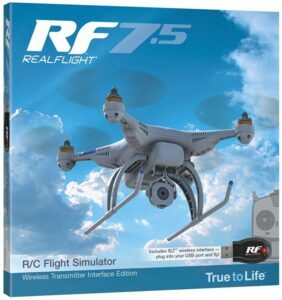 This is a great remote controlled airplane for those looking for something with impressive features but which is still easy to operate. It includes everything you need to get started and requires minimal assembly. The plane can perform a wide variety of tricks, making it perfect for experienced pilots or those who are keen to improve. It has an impressive wingspan of over a meter, making it easy to see when in the air. It comes with two sets of wings, one for the 3-channel mode and one for the 4-channel mode. This means the plane can grow with your child as they become better able to control it. It’s possible for up to 20 of these planes to fly together thanks to the frequency used. It gives around 15 minutes flying time on a single charge, which is longer than similar models. This is a great introduction to the world of remote controlled planes – it comes fully assembled and ready to fly. It is ideal for older children as it isn’t designed for repeated crashes. However, the controls are simple to learn, so with some teaching and some help, younger kids will be able to master the plane. The airplane toy is suitable for outdoor use. It requires a runway of around 10-15 feet to take off – it’s great to use in a large open field. The plane flies best in calm conditions, so it’s best to use on a day when the wind is low. This RC plane has great features and comes fully assembled and ready to fly from the box. It has good specs, making it great for learners and adults alike. The flying plane toy is great for indoor use and has a range of 10 meters. There are 3 channels, meaning the plane can move in different directions. The transmitter requires six AA batteries, so it’s a good idea to buy some rechargeable ones. The radio-controlled plane is very light but also durable. This means it’s great for beginners as it can withstand a few bumps and crashes. The toy takes under half an hour to fully charge, giving you more airtime. This RC aircraft is great for older kids and teenagers. 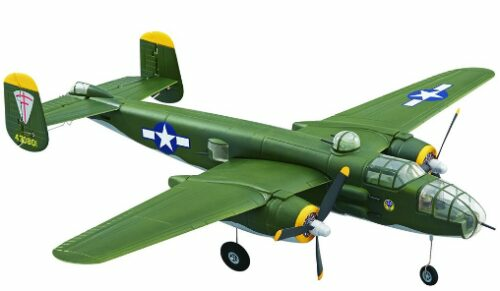 The plane is modeled on the American bomber planes used at Pearl Harbor, so it would make a great collectors’ item too. The plane is more advanced than some of the other models listed here. It requires a transmitter to be purchased separately. However, there is also the option to purchase the fully Ready to Fly model if preferred. The model airplane requires some assembly before it can be used. This could take up to an hour, so if buying for a younger child, adult help will be needed. The toy can be used indoors or outdoors – your child is sure to find somewhere suitable for flying. The eye-catching appearance and impressive features make this a perfect plane for those looking for a more advanced model, or even for parents to play with. 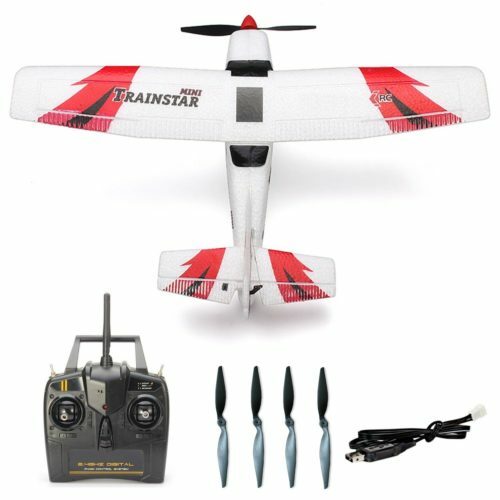 This RTF radio controlled airplane is really easy to fly, making it the ideal choice for beginners. It has a 6-axis gyro system for maximum stability, and 3 channels to control. The wingspan of the plane is nearly 16 inches, and it is 12 inches long. The range on the radio-controlled toy is over 300 feet, so the larger size makes it easy to see when flying further away. The remote of the RC aircraft offers three modes for different skill levels. This makes it perfect for siblings to share, or even for parents to have a go. The charging time is around 90 minutes, which gives 15 minutes of flying time. The airplane toy is made from strong foam, which means it recovers well from crashes. It also makes the plane lighter, therefore giving improved battery life. This smart gadget would make an excellent gift for someone who would like something a little bit different. Simply make a paper airplane and attach the motor and you’re ready to go. It’s important to check that your smart device is compatible before purchase, as it requires an app to be installed. The app-controlled plane offers an impressive range of nearly 200 feet and gives 10 minutes of flying time on a single charge. 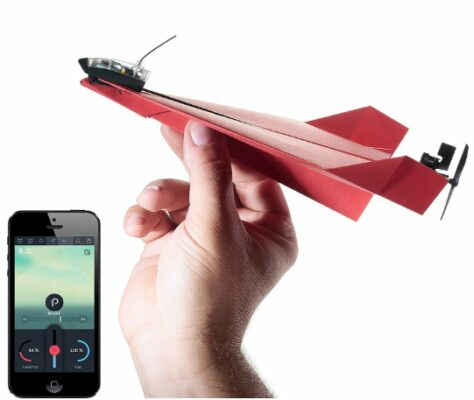 It is easy to control – simply tilt and twist the smartphone to make the plane fly! The paper airplane toy offers both beginner and advanced modes, making it perfect for children of all ages. It is educational, too – your child can learn about the best ways to fold the paper to make the plane fly in different ways. younger kids thanks to its strong construction. The materials used are light and flexible but can also withstand bumps and crashes. The radio-controlled plane offers a very impressive range of up to 200 meters, making it perfect for use in large open spaces. It has a wingspan of 50cm, yet weighs only a few ounces. This lightness gives the plane a good battery life of up to 25 minutes – far longer than many other models. It’s possible to do some tricks with this toy airplane – parents will love to help their kids learn how. This ARF remote control aircraft is perfect for older kids who need a challenge. It requires a compatible radio and either an engine or a motor to be fitted. This would make a great project for mom or dad to work on with a child – everyone will enjoy learning about the new hobby together. The assembly isn’t difficult, and the extra parts are affordable, making this a great option for young teens looking for something more advanced. The model plane is much larger and heavier than some of the other models, making it great for more experienced pilots. The wingspan is nearly 70 inches, and it weighs around 9 pounds. The large size of this RC model airplane give it good stability in all conditions and make your tricks and maneuvers look even more impressive. This is a great toy for kids and adults alike. This is a great product for kids who want to try their first RC airplane toy. It offers a lifelike simulation of flying a remote controlled plane, helicopter or drone. However, there is no chance of damaging an expensive model with this simulator. It comes with a USB transmitter, and the software requires a computer (check the required specifications to ensure it will be compatible with your PC). There is the option to play in multiplayer mode and connect a microphone for voice chat. The simulator is great for practicing in a range of conditions. Your child can practice landing and be taking off on water as well as flying at night. There is also the option to fly in various wind conditions, so you can see how a real RC plane would handle in different weathers. The Transtar Exchange is an excellent choice for older children who are looking for a serious radio-controlled airplane. It can be used in 3-channel mode or 4-channel mode, depending on how challenging you want the flight to be. This makes it perfect for children, as it will last many years before they become bored with it. The plane is also challenging enough that adults and older children will enjoy having a go, too. For those looking for a cheaper introductory remote control airplane, the Top Race RTF plane is the best choice. It comes at a great price and is really easy for beginners to learn how to use. It is made from a great-quality material, which is strong enough to withstand being crashed a few times. The range on this RC model plane is huge, and the plane itself is relatively large too. This means it’s great for kids of all ages to enjoy in wide open spaces.